So we've got not one, but two MSI boards in our labs! The GD80 is MSI's premium P55 motherboard, with the GD65 already seen and we hear there's a micro ATX GD45 in the works too. On the downside, we'll come right out and tell you to expect this board to be expensive, however, let us explain why: there's plenty of new things to tinker with. In the vowel-dropping Web two point ooh society we now exist in, MSI's "Xtreme Speed" falls right into place. It denotes a package of components that builds on what we've already seen on the MSI P55-GD65 board that includes the current DrMOS and GreenPower hardware, as well as the new OC Genie button, software and the thicker 8mm SuperPipe hardware we've delved into before. There's the V-Check here too, that offers a dedicated place to poke in a multimeter to read the real-time voltages, just like on the GD65, except now it sits next to a set of four micro-switches that overvolt CPU or CPU VTT, DRAM and P55 by 0.1V and 0.2V increments respectively. They are a little fiddly, but work in conjunction with the base clock buttons at the base of the board for upping the performance once in-OS to get that much more out of the overclock. In conjunction with this, there's the usual and ever useful two digit POST readout to diagnose boot issues, as well as a clear CMOS button sat mid-board rather than on the rear I/O. Considering the growing number of buttons down there, short of moving them all off the board for convenience, we can't complain that much about the cramped access if multi-GPU or peripheral cards are used. On the subject of Multi-GPU - both SLI and CrossFire are supported, however don't confuse the GD80 with the "Big Bang" board that looks almost identical, but includes a very special Lucid Hydra chip as well. The GD80, unfortunately, comes without. Another feature we like is built onto the GreenPower phase switching; as it stands we already hold this VRM tech from MSI in high regard: it doesn't rely on a hundred power phases of hardware e-peen, simply ten, combined with a very acute and extremely fast-acting phase switching technology that we've seen before saves a notable amount of power. To further make this feature more transparent, MSI has included another LED digit readout on the board by the CPU socket that specifies the exact number of phases in use at any one time. OK, it's a bit frivolous at best, but it's cool to see, and one up on the competition in a good way. Gigabyte squeezes in the goods into this micro-ATX P55 motherboard. It's not all that cheap but it still squeezes in CrossFire and SLI support, as well as plenty of features. We check if it trade blows with the big boys to decide whether it's worth pairing with the popular Core i5-750. MSI's performance-orientated P55 motherboard is the GD65. With the looks and some of the features its bigger brother, the GD80, but a price closer to its cheaper brothers, we had a look to find out if this board is the Lynnfield board to buy. 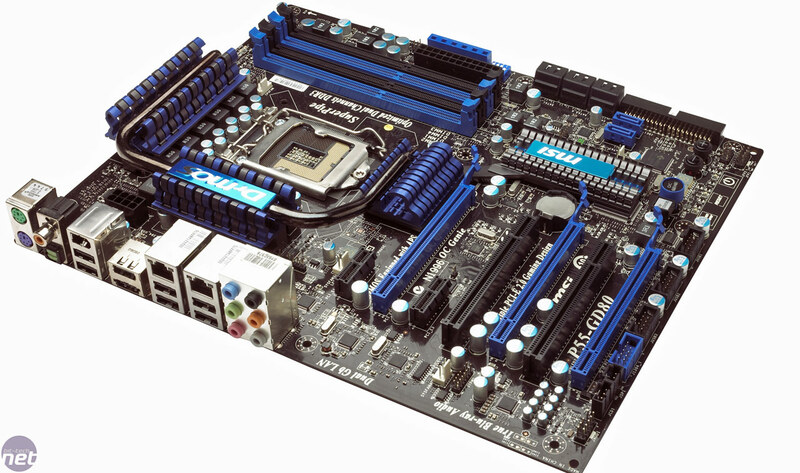 Our first (of many) P55 motherboard reviews starts, as ever, with Asus' Deluxe. It's expensive and bridges an awkward middle ground between Republic of Gamers and lesser featured boards, but does it still command excellent Asus quality and must have features that makes it a must buy?